Fez almost never happened for us. One too many Tripadvisor reviews pointing out the negatives got to us and we almost nixed it. On the last day of our stay in Chef, we ran into a couple who had just left Fez. 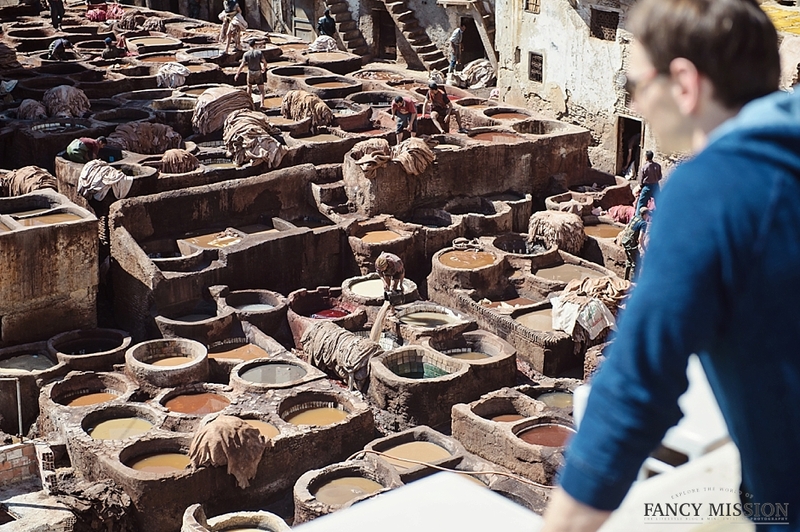 “If you must see any place in Morocco, go to Fez,” was all they said. We glanced at each other at the coffee shop, grabbed our bags and literally ran to our hotel to collect our belongings and make it in time for the next bus leaving for Fez. We figured it we made it to the bus station on time, Fez was meant to be for us. “If you must see any place in Morocco, go to Fez.” We repeated that to ourselves many times on the bus as we swayed between the rolling hills between the countryside. 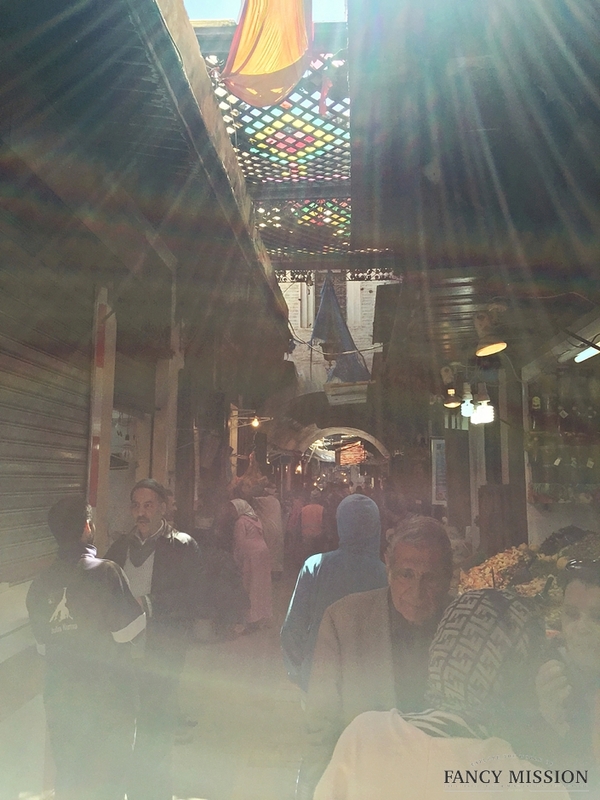 By the time we arrived in Fez, it was dark but the new city was glittering between the lights. We spotted a McDonalds and KFC. Not what we expected. Apparently the city is divided into two parts – the Old and New. The New city is where all of the modern day facilities and glamour are. It’s where the McDonalds and KFC is. It’s where you will see a lot of the younger generation Moroccan’s hanging around. Almost all men, of course. A quick ten minute ride by tax brings you to the outskirts of the Old City. It’s quite literally a fort – solid walls encircling the entire city and encamping the decades old lifestyle of the folks within it. At night we could see very little, and admittedly, it felt a bit unsafe without knowing where to go. The shadows between buildings played tricks on our eyes, and every nook and cranny looked foreboding. Most of it was in our head from the reviews of Tripadvisor and fatigue. An amicable fellow named Adil helped guide us to our Riad, and later guided us to the only open restaurant where we could get a quick bite. He even returned to bring us back to our Riad and agreed to show us around the city the following day. Adil was not a certified guide. His broken English was sometimes difficult to understand, but his smile was always warm. Navigating through the maze, it was clear he knew everyone. Even if he did not know them, he still nodded and spoke, “Salaam-vale-kum.” He brought us to locations we figured we must see, such as the tanneries, and then took it a step further by bringing us to some of his favorite spots. All in all, magnificent! Fez is not a beautiful city. It’s a more of a cultural hub, similar to how Marrakesh could be said to be a tourist hub. Fez had centuries old culture embedded in it’s maze of twelve thousand and more streets. The traditions and lifestyle of the families are consistent for decades. It has a different type of beauty – there’s beauty in the way people interact, in the way artisans lovingly work on their craft, in the way people demonstrate their pride of their city. “I went to Marrakesh once, but I came back. It’s too new, ” Adil noted when we asked if he ever thinks about leaving. And we agree. 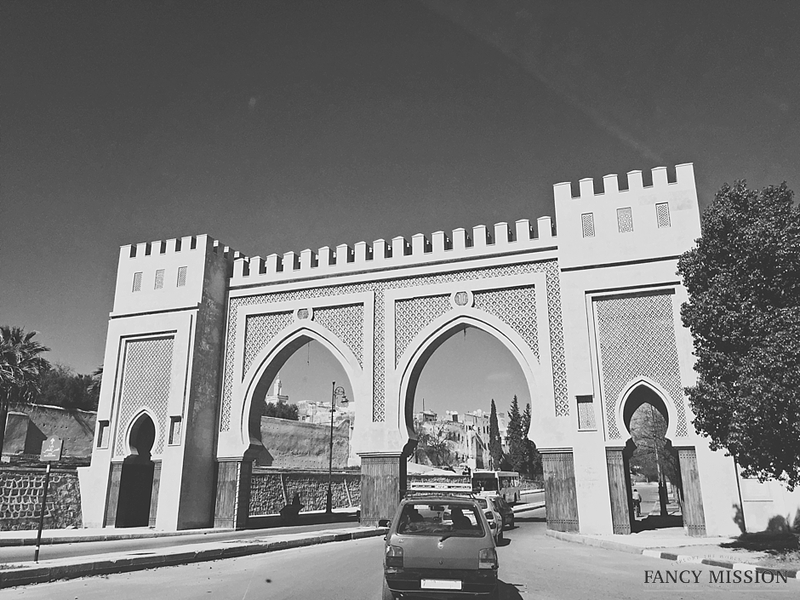 If you must see any place in Morocco, go to Fez.